Indie filmmaker Rian Johnson takes over for J.J. Abrams (who remains an executive producer) and his trademark "mystery box" in the mid-chapter of this new trilogy in the ominously but appropriately titled The Last Jedi. 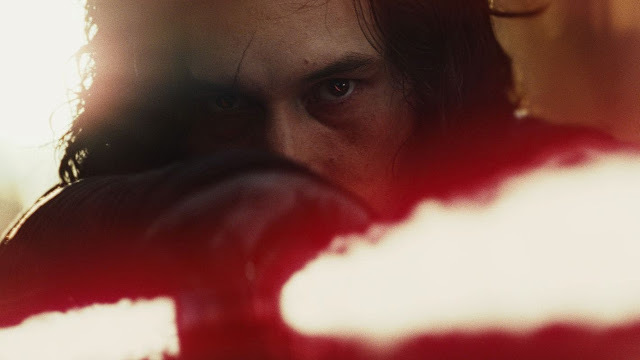 Where The Force Awakens was a follow-up and slight remake of the original franchise, Johnson firmly sets out to forge a completely new path and wondrously breaks most of our expectations. In many ways, The Last Jedi is a very atypical Star Wars franchise movie entry (just barely) despite specifically addressing all the open threads left hanging in the previous episode. Much of the action takes place on more Earth-like, outdoor locations not specifically in galactic feeling other worlds. Johnson compacts things and immediately puts our heroes and their shrunken forces in peril mid-threat despite their victory at the end of the last film. Mark Hamill as an embittered Luke Skywalker is boldly different. His tease at the very end of The Force Awakens is fully paid off. Hamill very much embodies the bitter fallen hero and his story of redemption is wholly compelling. Where older Han Solo was reset to a version of his younger self, Luke is clearly scarred by his life as a Jedi. The departed Carrie Fisher gets much more to do with a stoic and wise performance as the leader of the Resistance and troubled mother. Some of her emotional scenes are extra accidentally heartwrenching in light of her real-life death. In the midst of so much going on, newcomer Kelly Marie Tran's Rose, the heart of the film, is a welcome addition and formidable new character and emotional foil for John Boyega, who gets less to do, as the returning and still cowardly Finn now fully devoted to finding Rey. They have a fun, different chemistry on their compacted side storyline that stumbles but has ultimately a worthy emotional resolution. Once again, Daisy Ridley as our main protagonist anchors the film with so much grace and confidence. Her evolution and passion mixed with brashness continues to be refreshingly captivating. Juxtaposed to Ridley's bright enthusiasm, Adam Driver is absolutely riveting, fierce, and far from an imitation of Darth Vader. His Kylo Ren/Ben Solo is given such depth and conflict as not only as someone good gone bad, but his weaknesses and motivations are completely fleshed out in such interesting turns. The exploration of Rey and Kylos's symbiotic relationship and close emotional connection around the Force take the characters to dizzying heights of intrigue. Some of Abrams' other originated characters fare differently. Oscar Isaac's Poe Dameron is still a rogue and motivator of the Resistance, somewhat relegated here, but he becomes more subservient and a nuisance to the commanding Leia and Laura Dern's luminous new Vice Admiral Holdo. A very wiry Domhnall Gleeson is mostly a comic punchline as the ineffective sad sack General Hux, whereas Andy Serkis' Supreme Leader Snoke's mysterious powerful presence is presented in a surprisingly satisfying fashion. There are some all-timer shots and sequences framed splendidly by cinematographer Steve Yedlin. What Johnson truly brings is a definite cinematic vision to this universe. His artistry is dazzling and thrilling. How he executes new and legacy characters from a ambitious script in such imaginative and inventive ways is more than admirable. This film opens the world of Star Wars to new possibilities and let's go of past conceptions while acknowledging their massive impact. The opening sequence alone is one of the most satisfying sequences with such verve and energy. Despite some oddly out of place but hilarious turns of scenes, the sequel uses it weird, out there vibes to build on the heady ideas of redemption and resistance in such exciting ways. If anything, there's too much story and development going on with so many plotlines, likely to have been unfolded in a third film, are directly addressed or taken care of in dramatic fashion during the film's jam-packed final act. The Last Jedi is an audacious and bold journey in the Star Wars universe. It essentially resets (or corrects) much of what The Force Awakens re-established. It's an emotional, consequential journey of such great highs that breaks much of the established world and characters it's tasked to reimagine. The film really reaches. It extends. It goes beyond what we know of Star Wars with only so much fan service. It's truly artful and its own complete experience outside of everything while commenting on its own existence as a chapter in a bigger story of destiny and legacy.